The recent debacle of David Cameron’s filmed condemnation of Nigerian and Afghan corruption and the Queen’s remark on Chinese officials’ rudeness highlights the persistence of imperial thinking in Britain. There seems to be a continuing assumption within the British establishment that it sets an example for others to follow and that the British are owed deference by others. Ever since evangelical antislavery activists campaigned for Britain to abolish the transatlantic slave trade, Britons have assured themselves that imperial overrule is compatible with the “benign tutelage” of other races and nations. Unlike the other European empires, Britons tell themselves, theirs was an empire founded on humanitarian compassion for colonised subjects. The argument runs like this: while the Spanish, Portuguese, French, Belgians and Germans exploited and abused, the British empire brought ideas of protection for lesser races and fostered their incremental development. With British tutelage colonised peoples could become, eventually, as competent, as knowledgeable, as “civilised” as Britain itself. These platitudes have been repeated time and again – they are still at the heart of most popular representations of the British Empire. Even when we are encouraged to pay attention to empire’s costs as well as its benefits, these costs are imagined solely in terms of specific incidents of violence such as the Amritsar Massacre in India or the suppression of the Mau Mau rebellion in Kenya. Britain has excused itself from that most structural injustice of empire – the slave trade itself – by the fact that it was Britain that pioneered its abolition. Acknowledgement that cities such as Bristol, Liverpool and London were enriched by Britain’s dominance of the trade, that many stately homes were built on its wealth and that the compensation money paid to owners upon emancipation – rather than the enslaved – helped drive the industrial revolution and the growth of the City of London, tends to be confined to more critical quarters. By contrast, runs the same argument, the benefits that empire brought to the world are universal. Everyone – Nigerians, Afghans and Chinese included – should be grateful for the rule of law, the English language, modern education, railways and free trade, all things that Britain provided in order to usher in the modern age. But to remember empire in this way is an act of incredible selectivity, if not wilful forgetting. Far from being of universal benefit, these features of British rule were designed in the first instance to benefit British settlers, producers and traders. The partial inclusion of colonised peoples themselves in their benefits had to be hard won by those peoples in the face of racist laws and customs. Black people generally weren’t allowed to travel on the railways on the same terms as white people. Gandhi’s political awakening came when he was thrown out of a whites only carriage on a South African railway. Government-run education systems varied hugely in time and place but were generally not extended to “natives”. Their education was left to mission societies able to reach only a tiny proportion of them. 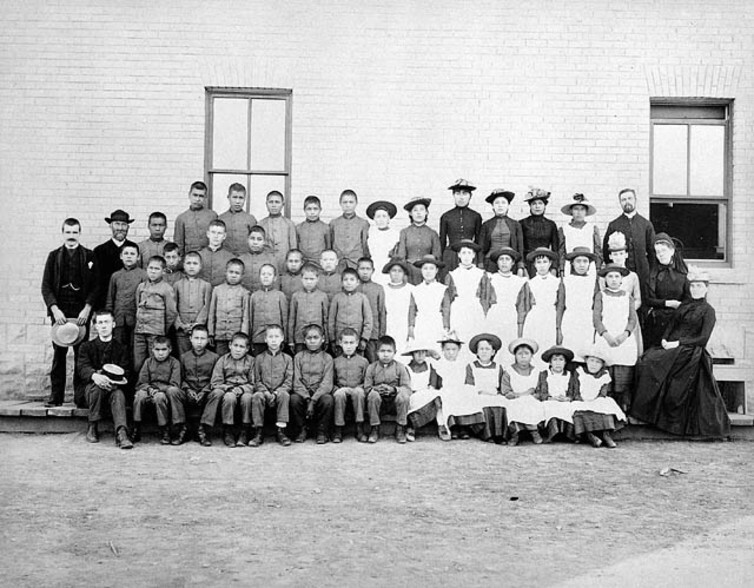 The Indian Residential Schools of Canada and many of the institutions into which Aboriginal and so-called “half-caste” children were forced in Australia were notoriously neglectful and abusive. St. Paul’s Indian Industrial School, Manitoba in 1901. One of the first things that some indigenous elites did with their education was challenge white peoples’ entitlement to rule their countries. The colonial “rule of law” generally worked in favour of white settlers, elites and men. Even where explicitly racist legislation was avoided, proxies for race such as English language tests were used. These either imposed different standards on “native” populations or kept Asian people out of settler colonies unless their labour was required. The wider adoption of English certainly facilitated more global conversations and business transactions among male elites. But it only served to heighten the exclusion of most non-English speaking subjects and women from access to the credit and political capital that flowed through Anglophone global networks. Much the same could be said for free trade, which tended to enrich the colonial masters rather than their imperial subjects – let’s not forget it was the argument for free trade which was used to force China to continue accepting opium imports against its will, starting China’s “Century of Humiliation”. Those under the “benevolent” rule of empire did not necessarily experience British imperialism as a gift. For many around the world, the costs of empire were not restricted to the occasional episode of violent repression, nor even to structural injustices such as the slave trade. Rather, these were systematic, everyday costs. These costs included exclusion – from power and privilege in their own lands – coupled with humiliation at being made to pay deference to white people who assumed the right to govern them. Before condemning the corruption and rudeness of others perhaps we should remember the act of imperialism itself may be seen as self-interested, arrogant rudeness on a global scale.